Home » Blog » Homemade Chocolate Pudding! 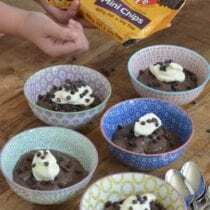 Chocolate pudding used to be a regular thing for me as a kid and also for my kids before we cut out all highly processed food. We used to “make it” ourselves. By that I mean we would mix milk together with some mystery powder out of a box. I just thought that was how it was done. 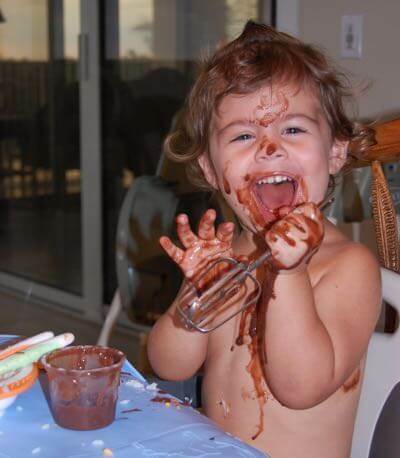 I can’t believe I even managed to find this picture of my now 11-year-old (soon to be 12) daughter during one of our many pudding making moments back in the day! She was hamming it up for the camera (and yes, it was an actual camera back then, not my phone, haha). Once we made the switch to real food, though, it meant saying goodbye to things like highly processed instant pudding (and for good reason!). Come to find out, it’s full of artificial additives, preservatives, and other unwanted ingredients. Not to mention it contains way more sugar than necessary to taste great. And here’s the funny thing – the box lures you in by saying it’s “instant” pudding. But the real made-from-scratch version only takes all of 5 minutes to make. You’re really not saving all that much time in the end. 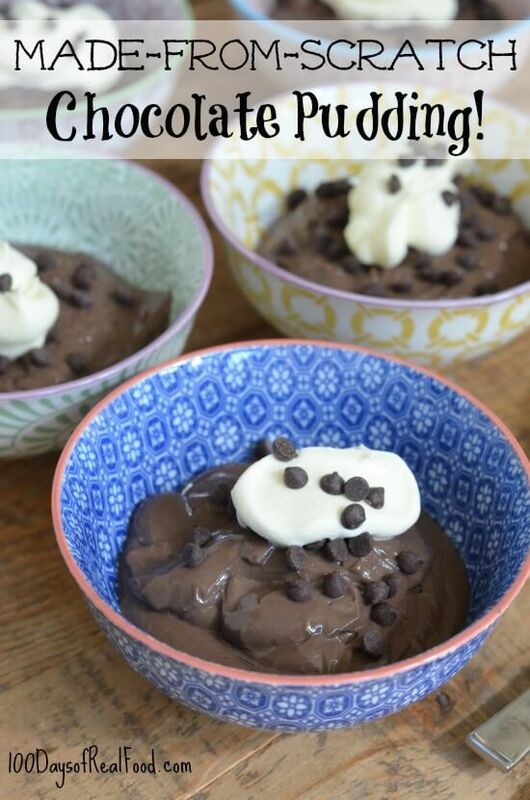 So this recipe for Homemade Chocolate Pudding (which does contain regular sugar and refined corn starch and is therefore considered a special treat) is definitely worth it! For this recipe, I used our favorite chocolate chips from Enjoy Life! Since their chips are only made with ingredients that are supposed to be in chocolate, they’re also allergy friendly (which, let’s face it, can come in handy these days) as well as vegan and paleo. And they taste great, too. I loved adding the mini chip version as a garnish on top so you’d still get plenty of pudding in every bite. I also melted some right into the recipe. Trust me, this is a good one! 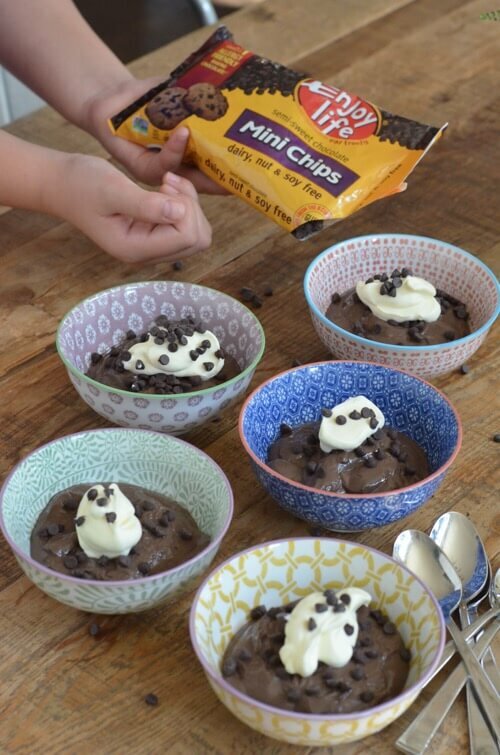 :) And be sure to check out what’s coming soon – Enjoy Life chocolate chips in little snack pack sizes. I know my girls would flip out if I surprised them with this treat in their lunch one day! In a wide-bottomed sauce pot, whisk together the milk, sugar, corn starch, cocoa powder, and egg. Set it over medium heat and whisk until the mixture begins to bubble up. Turn the heat down to medium-low and keep whisking until thick and creamy, less than 5 minutes. Remove from heat and stir in the chocolate chips, butter, and vanilla. Divide among 4 or 5 bowls, cover with plastic wrap and refrigerate until the mixture cools and is set, about 2 hours. Garnish with whipped cream and more chocolate chips, if desired, and serve. YUM! *We recommend organic ingredients when feasible. **With a few substitutions this recipe can be made dairy-free and allergy-friendly. I thought sugar was not allowed? Do you have any idea if this would work with coconut milk? I substitute coconut milk for dairy in all of my cooking because of allergies in the family – but I’m not sure if pudding would set. Hi there. We have not tried any substitutions but I do think it would work. Made it yesterday after I saw the post on FB. It was so easy and yummy. Hoping to find a vanilla pudding recipe when I search the site. I use the pudding recipe from the better homes and gardens basic cookbook. The only difference between chocolate and vanilla pudding is the cocoa powder. So, for vanilla, simply omit the cocoa powder. Would I be able to sub unsweetened Almond Milk to help make it dairy free? Hello. We have not tried any substitutions but I do think it would work. Looks great can’t wait to make! This looks fantastic! Now i have a new recipe to try during the hurricane tomorrow (if we still have power). Thank you!!! Can you use arrowroot instead of cornstarch? Thanks! I was wondering this as well…. This would be great to know…my daughter is allergic to corn starch. We’ve not tried that substitution. Let us know if you do. Hello. We’ve not tried it in this recipe but I have found that arrowroot works well as a sub as long as the food does not need to be reheated. I hate to be a downer here, but Enjoy Life brand is not fair trade or ethically sourced. They are one of the many chocolate companies who continue to engage in child slave labor and trafficking to make their products. One alternative I found is Nuts.com – they have fair trade mini chocolate chips that are also vegan. I hope everyone gives this some consideration because it’s a real problem in the world today. May be a downer but an important consideration for sure! Child labor, with no education…soooo cruel. Do you think I could sub in cacao powder for the cocoa? Hi Michelle. I use cacao almost always but have not tried it in this recipe. This looks awesome. We arent a huge milk family. I understand it would change the thickness….but how about with a skim milk or almond? Hi Haley. We’ve not made subs in this recipe but I think it would work. My daughter is allergic to cows milk. Do you think coconut milk would work? We’ve not tried but I think it will work. You said it takes 5 minutes yet you have to let it set for 2 hours. The same is with the boxed pudding. Five minutes to cook … and then you let it chill. Just so everyone knows we’ve made this twice with unsweetened almond milk and it works perfectly. Do you have any suggestions for making this without the egg? My son is allergic. Hi. You might give a flax egg a try: http://minimalistbaker.com/how-to-make-a-flax-egg/. Thank you for this awesome recipe. Made it for guests and everyone including myself loved! I doubled it and would say it took about 15 minutes before it thickened but this will be my go to recipe from now on! This may be a silly question, but does the raw egg end up fully cooked by the end? I’m asking bc a pregnant woman will be eating this and I don’t want to put her at risk by the chance of any raw egg being in there! Has anyone tried maple syrup instead of sugar? Or agave nectar? Love this website and your cookbooks! Hi. Well, we do not use agave but in developing recipes, Lisa usually tries honey or maple before going with granulated sugar. I was so excited to make this but unfortunately in never set up. Has anyone else had this problems? Any ideas on what went wrong? Thanks!! Any suggestions for making this into banana pudding? Lauren, did you try making it banana pudding? If yes, how did it work out? I’m looking for a good dairy free banana pudding recipe for my son’s birthday treat. Hi there. That is not something we’ve tried. If you give it a go, let us know how it turns out. Love this recipe! My go-to for a chocolate snack with my daughter.